You are here: Home / Is the War on Drugs Ending? Now that two states have made marijuana legalization for recreational use a reality, has the dam broken on public opinion and public policy on fighting the war on drugs? Over the past several years, a changing attitude has fallen across the nation in regards to the prohibition of drugs. 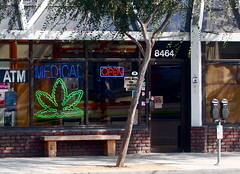 While the main shift has occurred in numerous states in regards to medical marijuana policies, other changes have occurred in the crime and punishment arenas, as states struggle to make ends meet and are forced to look at alternatives to the traditional lock ‘em up and throw away the key method. Do these changes signal an end to the War on Drugs or merely a hiccup in the status quo? As of November 2012, Eighteen states now have medical marijuana laws and thirteen have decriminalized simple possession of marijuana (NORML). This doesn’t mean it’s legal to possess pot, merely that it’s only punishable by a fine when found in small amounts. However, civil citations for marijuana possession that are the equivalent of a traffic ticket certainly change incentives for local law enforcement. Of those states with medical marijuana laws, there are extremely varied programs, laws, and regulations in place to keep things running smoothly. In 2012, voters supported reduction and elimination of marijuana possession laws in almost every case. In addition to the 2 states that fully legalized marijuana, 5 cities in Michigan voted to decriminalize. Chicago enacted a decriminalization ordinance. A Gallup poll shows American support for legalization is at an all-time high, with 50% of those surveyed being in support while only 46% were opposed. Even when it comes to other drugs, the country seems to have a more treatment-based approach than ever before. Encouraged in part by a lack of funds, states have been forced to look at alternatives to the harsh sentences that began several decades ago. New York State, for example, repealed the extremely harsh Rockefeller Laws, doing away with many mandatory minimum sentences. At the federal level, the law that sent people to prison for crack cocaine at a rate 100 times more severe than those convicted of powder cocaine crimes, was reduced to be at least a little more fair, reducing the disparate sentence to only 18 times that of powder cocaine. Lawmakers from both parties and opposite ends of the liberal-conservative spectrum are becoming more open to criminal laws that focus on treatment and reducing recidivism rather than imprisonment. But it isn’t clear how far these new attitudes will go.These facts alone seem to suggest that the Drug War may be on its way out. But others seem to suggest otherwise. The federal government has resisted the medical marijuana movement, despite promises that they would keep their nose out of the business of the states. Recently, marijuana dispensaries in California began shutting down after receiving letters from U.S. Attorneys that there would be consequences if they didn’t cease business. Numerous raids have been conducted on dispensaries in several states at the hands of federal enforcement agents. All of this because marijuana remains a Schedule I drug under the federal statutes, which has no exceptions for medical marijuana laws at a state level. Changing sentencing laws and practices to reduce the number of people being sentenced to years in prison reduces the cost to taxpayers and may have a positive effect on recidivism, when paired with treatment and other support measures. But lawmakers must be cautious that they aren’t only concerned with reducing costs. Sending addicts back onto the streets without help for their illness could create a revolving door. Drug Courts and other measures that treat drug crimes as violations of law and a public health issue seem to have the most promise. Countries have been able to end drug prohibition with positive results but not simply by cutting drug crimes out of the penal code and failing to follow up. In Portugal, for instance, drugs were legalized in 2001, making them the first European country to abolish all criminal penalties for drug possession of any kind. But this change was accompanied by a national treatment program where anyone caught in possession would be offered optional drug treatment. Despite the fact that this treatment was completely optional and there are no negative consequences if you decline it, Portugal has seen major changes over the past decade. In the first five years, drug use among teens dipped and HIV infections did as well. More than twice as many people sought treatment after the law change than before. Lawmakers are often concerned that lax drug laws will lead to increased violence and other crimes. But a recent study from the United Nations suggests otherwise. Of all the countries studied, the Netherlands, who do not enforce most drug laws, had a murder rate of 1.1 per 100,000 people, the lowest of any country examined. Those with higher homicide rates were countries where the War on Drugs was in full swing. Is the United States ready to end the War on Drugs? Perhaps not. The people are more amenable than ever to legalizing marijuana, which could be a step in the right direction. But the powers that be will be harder to convince. Perhaps the only thing that will further push lawmakers towards eventual cease-fire in this war is a continued economic crunch paired with the knowledge that this war is costing the country an average of $500 per second.